The ResearchTies source list has a new format. Rather than separate columns, the source citation fields have been placed together in bibliographic format. This allows users to copy and paste a bibliographic citation into other works with minimal editing. Remember, the author and title are recorded separately so that they can be used in the dropdown boxes of ResearchTies, and the remainder of the source citation for any source is recorded in the “Additional Citation Details” field. If users record the additional details in bibliographic format, the source list will be accurate. Second, it is now possible to display titles in italics. A checkbox has been added to the source template for users to indicate when a title should be italicized. A third improvement is that the source’s URL has been added to the list. In the past, the URL was recorded in the source template, but it was not visible on the source list. With the URL now showing on the list, it is possible to use the source list as a bookmark list for all the sources you have used. 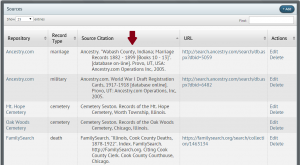 Whether you use FamilySearch, Ancestry, or other sites for research, it takes many clicks to drill down to sources that you use regularly—especially censuses. 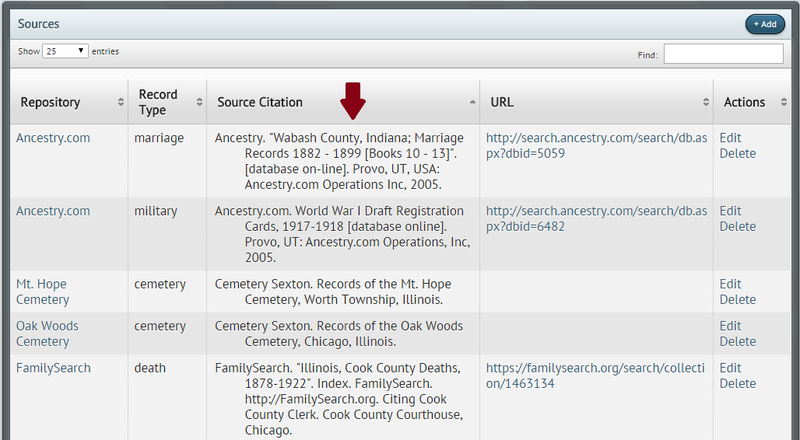 Use the source list in ResearchTies to record the URL of the search page for each source. When you want to search it again for a different person, open the list, click on the link, and you are ready to begin the next search. As your source list grows, it may require paging through the list to find a particular entry, even if the list is sorted. If this happens, be sure to use the “Find” field in the upper right corner of the screen. Type “census” in that field, and only sources including that term will remain in the list. Or, type “1850” and only entries with 1850 will remain in the list. Experiment with this to see how it works, but the sort and find capacities are powerful tools to speed up research, especially in sources that are used repeatedly.